Joint family system is still prevalent in the Indian society. In a traditional joint family, grandmother plays a significant role in raising grand children especially when they are small. I have spent my formative years with my grandparents and they have had a great influence in shaping up my values and beliefs. 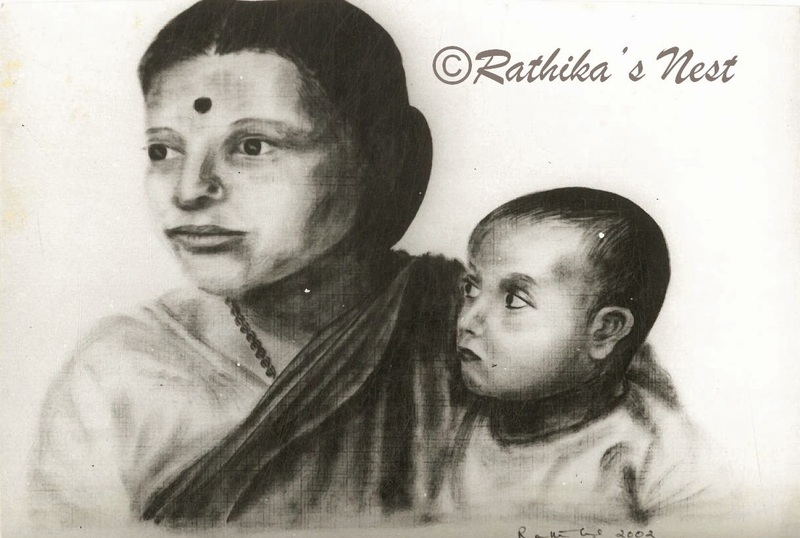 In this monochrome Indian ink painting, I depicted the quintessential grandmother and her grandchild in a protective embrace. Old women often wear prayer beads made of basil wood (துளசி மாலை) around their neck, which is shown in this picture. ‘You and Me’ is one of my favorite works that depicts the comfort between the granny and baby. This painting was executed using dry brush technique, which had helped in delineating textures and creating depth. Both the Indian ink medium and the support acted in synchrony to create the elements of the composition in full depth with limited use of lines. This work is my way of paying tribute to Indian grandmothers!